Is it starting to feel like the blueberry and Thai food blog around here? Given that the last few posts have been about blueberry muffins, Thai grilled shrimp, and blueberry galettes, it may seem that way. I threw in the migas recipe last week just to break things up a little. 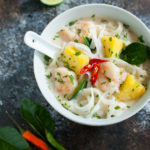 But now I’m back with another Thai recipe – Thai shrimp soup with noodles and pineapple. I know it was 90 degrees in Houston yesterday and here I am posting a soup recipe. Maybe it’s because I am Vietnamese and soup runs in my blood that I think it’s perfectly normal to eat soup regardless of the weather outside. There’s something about Asian soups especially Thai soups that feel refreshing even though they’re served hot. The fresh pineapple chunks and the incredibly fragrant kaffir lime leaves make this soup feel almost tropical. Kaffir lime leaves can be hard to find but they are so worth the effort to track down. They impart a unique citrusy flavor to any dish. They are available at most Asian grocery stores. For those in Houston, Central Market carries fresh kaffir lime leaves in the produce section. A quick look on Amazon showed that you can also order fresh lime leaves on-line. Fortunately, kaffir lime leaves will keep almost indefinitely in the freezer so you can stock up and be ready to make your favorite Thai dishes anytime. The flavor of the frozen leaves won’t be as strong as the fresh leaves so just add a few more leaves to compensate. Although the lime leaves are important in flavoring the soup, you don’t want to actually eat the leaves since they are pretty tough. Just push them aside in your bowl or pick them out as you eat the soup. This Thai shrimp soup even has the approval of my two teenage daughters who happily slurped it up for dinner last night. Honestly, could you ask for a better endorsement? In a 4-quart saucepan, add enough water to fill the pan about 1/2 full. Bring the water to a boil and then add the rice noodles. Cook the noodles until they are just tender, about 6 minutes. Drain and rinse the noodles. Transfer the noodles to a medium bowl (save the saucepan). Add chopped cilantro and 1 tablespoon lime juice to the noodles. Toss to evenly coat the noodles. Set aside. Wipe out the saucepan with a paper towel. To the saucepan, add the coconut milk and the lime leaves. Bring the mixture to a simmer over medium-high heat then add the shrimp. Cook until the shrimp are almost cooked through. Stir in the fish sauce, sugar, and broth and return mixture to a simmer. Add the pineapples and the remaining 2 tablespoons of lime juice. Cook until pineapples are heated through. Season soup to taste with more fish sauce if desired. Divide noodles among serving bowls and pour hot soup over noodles. Serve soup with extra cilantro and sliced Thai chilis if desired. The dried flat rice noodles are sometimes called pad thai noodles. Kaffir lime leaves can be found at Asian grocery stores and some specialty grocery stores. In a pinch, you can substitute fresh lime peel for the kaffir lime leaves. Use a vegetable peeler to peel thick strips from the lime. Use about a 1 x 2 inch strip of lime peel for every medium sized leaf called for in the recipe.